Kinetic Sand is a brand of moldable sand. It is mess-free, non-toxic, easy to clean up, and hard to put down. It may happily entertain a child for a long time. Learn about its ingredients and how children can use it in creative play. The Kinetic Sand ingredients include 98 percent sand and 2 percent polymer. It can be shaped and molded much easier than typical sandbox sand or beach sand. It can be bought in many different colors. The texture of Kinetic Sand is so soft it is almost silky. It feels like it is flowing through the fingertips. Both children and adults enjoy manipulating it and molding it into shapes. Fidgeting with sand like this can help to reduce stress and be very calming for kids and adults. 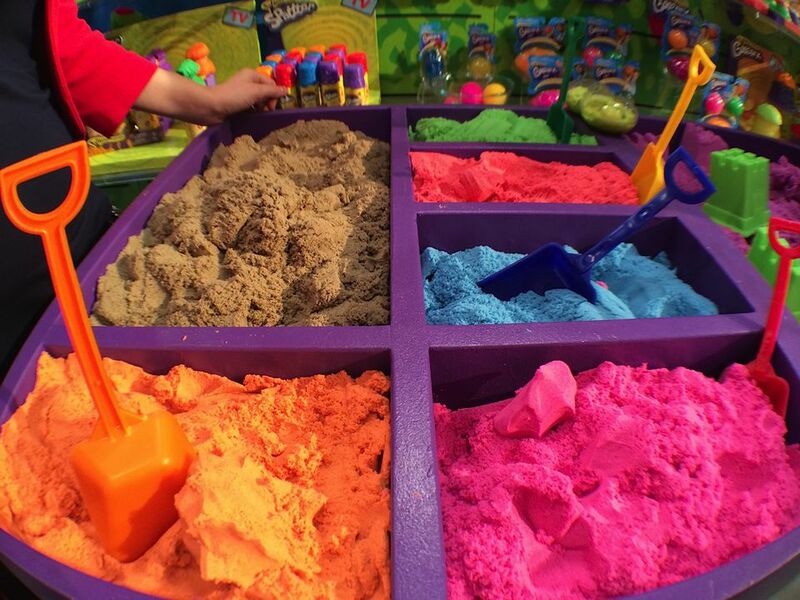 Kinetic sand is odorless while some similar toy products have a distinct odor. While many kids do not mind the smell, others hate it. Kinetic Sand is an excellent alternative for these kids. Kinetic Sand is mess-free. It will not get permanently ground into carpet or stain clothing. It sticks to itself and can be easily cleaned up with a vacuum cleaner. Large pieces can be picked up using your hands. Unlike Play-doh containers you had to throw away because they were left open, Kinetic Sand will never dry out. If it is left out, it can still be usable, in the exact same condition it was left in. Definitely make sure the child's hands are completely dry before using Kinetic Sand. If they are wet or sweaty, some sand will stick to their hands. However, once it dries, it is easy to wipe off just by rubbing and clapping hands together. Kinetic Sand has the same physical properties as wet beach sand without many of the drawbacks. It allows kids to use their beach or playground sand molds. When it is removed from the mold, it will show all the amazing details imprinted in the sand. It has many advantages over typical beach sand. You can't do much with dry beach sand. It has to be dampened to be used in molds or to make sandcastles, and it's hard to get the mixture exactly right. Once dampened, traditional sand is gritty, grainy, and sticky. It gets stuck everywhere, making it difficult to remove from pails, molds, and even from underneath a child's fingernails. Building sandcastles should be fun not frustrating. Dig out all those sand toys that never seem to work quite right at the beach. Put Kinetic Sand inside the mold. It will easily slide out when the mold is turned upside down and Kinetic Sand will retain all of those fine details that never show up with traditional sand. Take a pencil and encourage children to draw shapes or write letters, numbers or their name in Kinetic sand. Using an open storage container, gather up all sorts of small construction vehicles and the child may enjoy filling, dumping and pushing their tractors, bulldozers, and dump trucks. Buy Kinetic Sand on Amazon.com.